Waterfalls are the main attractions of the Cascade Corner region, in the southwest of Yellowstone National Park, though apart from two close to the entrance road (Bechler Falls and Cave Falls), they need long hikes to reach and most people stay at least one night in the backcountry. But some are within range of day hikes - long but not difficult owing to the mostly flat terrain, and these include Dunanda Falls and nearby Silver Scarf Falls; the former a dramatic 150 foot drop over the edge of Madison Plateau, the other a delicate whitewater cascade down a steeply-sloping section of the same escarpment. The round-trip distance to visit both is 17 miles, of which about half is through typical Yellowstone lodgepole pine forest, and the remainder crosses the wide open grasslands of Bechler Meadows. En route are several stream crossings, some via footbridges, others requiring wading, and while wildlife is not particularly abundant, there is a good chance of spotting bears, moose and beaver. 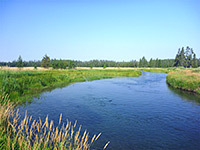 The shortest route to the two waterfalls is along the first 1.5 miles of the Bechler Meadows Trail and then the Boundary Creek Trail for the rest of the way, but a partial loop can be made by returning along a longer section of the Meadows trail, adding half a mile to the distance. For backpackers there are several designated campsites along the way, all pleasantly situated at the edge of woodland close to streams. 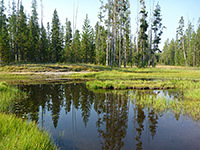 Because of the lower elevations, around 6,400 feet, compared to the rest of the park, the hiking season in the far southwest is rather longer, between about June and October, though early summer conditions are rather wet, with deeper creeks to cross, long marshy sections and abundant mosquitoes. Yellowstone National Park trail map, topo map of the Boundary Creek and Bechler River trails. 16 views along the Boundary Creek Trail. Dunanda Falls and Silver Scarf Falls (mp4; 1:02 min; 30 mb). The Bechler River ranger station, start point for the hike, is reached by a 24 mile road from Ashton, Idaho, the last 12 miles of which are unpaved - bumpy, and dusty when dry, but fine for all vehicles during summer. The road ends at a cluster of buildings including ranger residences, an information center and stables, plus a supply of drinking water. The nearest official campsite is in the Targhee National Forest a few miles south, while primitive camping is also available nearby, along side tracks. The ranger station sits on level ground surrounded by thick forest so there are no views of the wider landscape, and not for the first 2 miles of the hike. The path (Bechler Meadows Trail) starts on the north side of the enclosure, soon passing a junction on the right with a link to the Bechler River, then proceeds through the flat woodland for over a mile, until the first point of interest, a small meadow on the left. A lily pad-covered pond is passed not far beyond, and then the next junction, at the start of the Boundary Creek Trail, the shortest route to Dunanda Falls. Veering left, this path skirts a bigger pond and traverses similar woodland, quite overgrown, for another mile, until the trees start to thin out, replaced by patches of grassy land which allow the first views of the hills to the north, at the edge of the plateau. The trail eventually emerges fully out of the forest to the much more extensive prairie of Bechler Meadows; it crosses the slow moving Bartlett Slough (no bridge here) and winds through more patches of woods between larger open stretches. The first campground (9A1) is located a little way east of the path, near the next stream, Boundary Creek, here not too deep and so also crossed by wading. The hills ahead are now much more obvious, just a couple of miles away. The next mile or so is quite overgrown once more, over moist ground along the west edge of a patch of woodland beside the meandering, bushy creek. Another junction, on the right (east), is with a connecting path to the Bechler Meadows Trail; distances back to the ranger station are given as 6.9 miles here, versus 6.4 miles on the Boundary Creek Trail. Continuing north, the path reaches a pretty, sparsely wooded area with short pines and many wildflowers, extending either side of a stream, a branch of Boundary Creek, which is crossed by walking along a fallen tree acting as a bridge. Campsite 9A2 is nearby. Beyond, the land starts to slope up slightly, approaching the edge of the plateau, and the moist surroundings are replaced by a dry, short grass hillside where the trees are well separated. The trail crosses one small (warm) creek, a larger one, three times, and a tributary which is also warm due to hot springs upstream. There are many flowers around here too, along the creek banks and at the edge of the enclosing woods. The ground slopes up much more steeply now and becomes densely forested again, as the path reaches the junction with the 1/4 mile spur to Dunanda Falls. The spur path to Dunanda Falls runs along the edge of a pretty, floral meadow and reaches several overlooks on the rim of a sheer cliff, slightly above and away from the waterfall but still giving good views. A fainter path descends to creek level above the falls, though cliffs either side of the drop prevent a closer approach to the actual brink. The large boulders below the base of the falls conceal a thermal pool, whose waters are usually at just the right temperature for soaking; the spring may be reached via a hiker-made path starting lower down the main trail. Back at the Dunanda junction, Silver Scarf Falls is visible off to the east, and reachable by a short walk through the trees. The falls are actually a cascade, where an unnamed tributary of Boundary Creek drops 250 feet over about the same distance, flowing over bare, dark-colored rock, the whitewater spreading out to create a pretty, sheet-like effect. The slopes at either side are quite steep and loose, but climbing down to water level is not too difficult. Beyond these two waterfalls, the Boundary Creek Trail, now much less used, also descends to the stream and follows its canyon for several miles before climbing out of the valley and crossing flatter land to another trailhead, right on the west edge of the national park. The Bechler Meadows Trail provides an alternative way back to the Bechler River ranger station, adding only half a mile to the distance and encountering a similar mix of meadow and forest scenery. From the junction with the Boundary Creek Trail, south of campsite 9A2, a connecting path hands southeast through quite thick forest which has just a few sunny clearings and is mostly dry, relatively free of mosquitoes. The woods give way abruptly to a big, rather featureless grassy plain, interrupted by another, shorter woody belt before the next junction, with the Bechler Meadows Trail. A short diversion northeastwards along this route soon reaches the Bechler River, much of which is rather deep, but is forded here across a relatively shallow section, beyond which the path soon enters the long Bechler River canyon, site of many more waterfalls including Colonnade, Iris, Ragged and Twister. There are several small thermal pools off trail upstream along the river (west side), close to the ford. 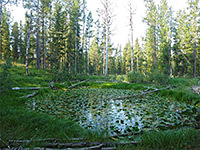 Heading south, the Bechler Meadows Trail crosses the central portion of the meadows for about 2 miles, at one point crossing a muddy slough a couple of times, the second via a fallen trunk, and eventually reaches Boundary Creek once more. The stream is rather deep at this point so the crossing is via a narrow suspension bridge, usable by only one person at a time. This marks the edge of the meadows, as beyond the trail returns to the forest and the scenery is little changing and somewhat monotonous for 1.5 miles, back to the junction with the Boundary Creek Trail, from where the ranger station is 1.5 miles further.